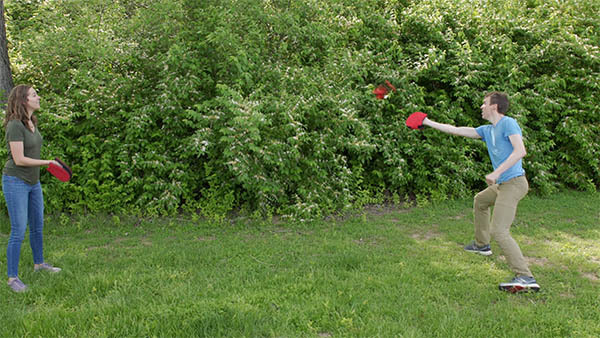 Waboba Voli Mitten Racket Game: Outdoor game with wearable racquets! Waboba Voli is a new type of game where your hand becomes your racquet! This intuitive outdoor game uses wearable hand rackets and a specially designed birdie to create a casual sport that anyone can enjoy. 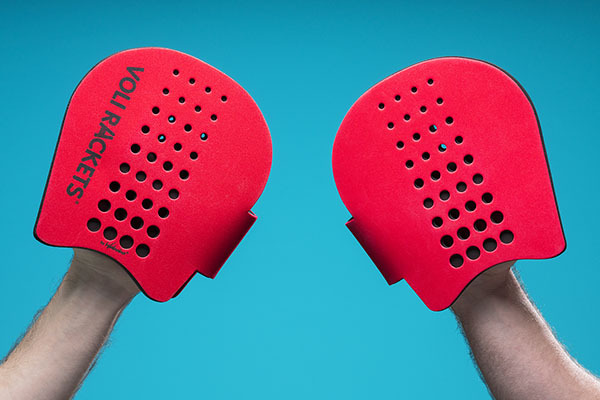 Slip your hand between the firm foam pads of the hand racket and use it to strike the flyer. There’s not much of a learning curve required; just wind up and smack it! 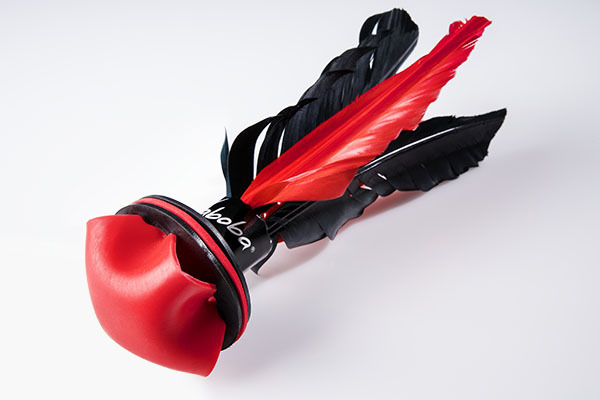 The bouncy birdie’s rubber tip and faux feathers do the rest, making it spring off your racket and soar through the air. Find a net to play a competitive game or just go to the backyard and see how long you can rally. This simple and fun game can be played anywhere you have a little space. Voli is a racquet game for people who think they don’t like racquet games. This easy outdoor game eschews burdensome “rules” and “nets” in favor of a more open-ended style of play. While you can find a court and play like badminton, you can have just as much fun seeing how long you can volley, testing how far you can hit it, or making up a game entirely your own. With Voli, your court is anywhere in the world (where you’re not in danger of breaking something). Made of rigid foam, the Voli hand rackets are comfortable to wear while still providing a hard surface to smack the flyer around. The two pads angle downward toward your fingertips, resulting in a snug fit that won’t fly off as you unload on the flyer. Everywhere on these rackets is the sweet spot (so you can have less frustrating misses and more raucous rallies). Durable foam rackets fit most hands. 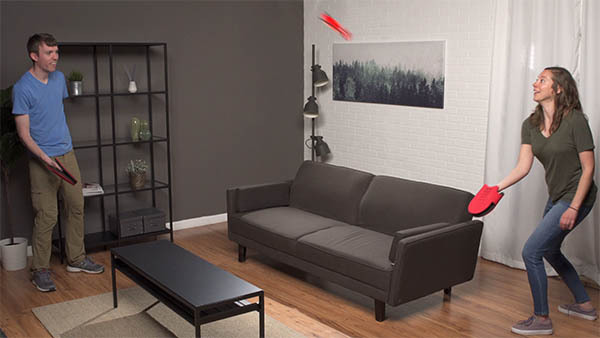 The projectile in Voli isn’t called a shuttlecock or a birdie—it’s called a flyer, because that’s what it does. The lightweight object has a rubber tip that leaps off the racket with startling ease and a feathered design that elongates its flight. The flyer’s tip is wider than a badminton birdie’s to easily produce satisfying smacks. Soft rubber flyer is durable and safe. 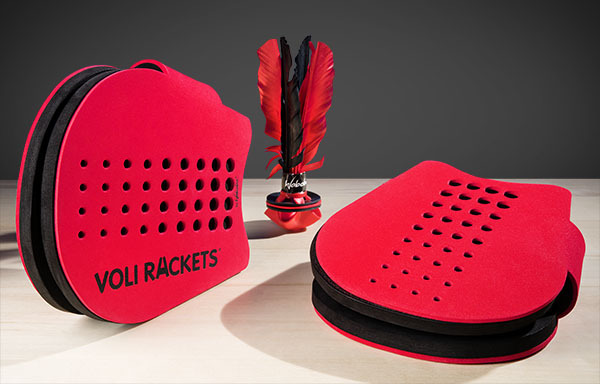 The Voli set contains everything you need for a game: two glove-like rackets and a flyer. You can play without a net, without a court, even without shoes if you want. In fact, the flyer’s end is so springy, you can even play with your bare hands and feet! Question: Is that the same birdie from Goodminton? Answer: It’s not exactly the same, but it’s a similar design. For that reason, both games are incredibly easy and fun. Question: So… what are the rules? Answer: You tell us! Voli is meant to be an open-ended game. It’s fun to just volley with a friend, but if you want a more competitive experience, try playing on a court designed for badminton, tennis, or one you made yourself.